If you don’t take the time to deliver preventative and maintenance care to your spa or hot tub, problems will fester and you’ll end up with a huge problem that requires equipment overhaul, plumbers and more. 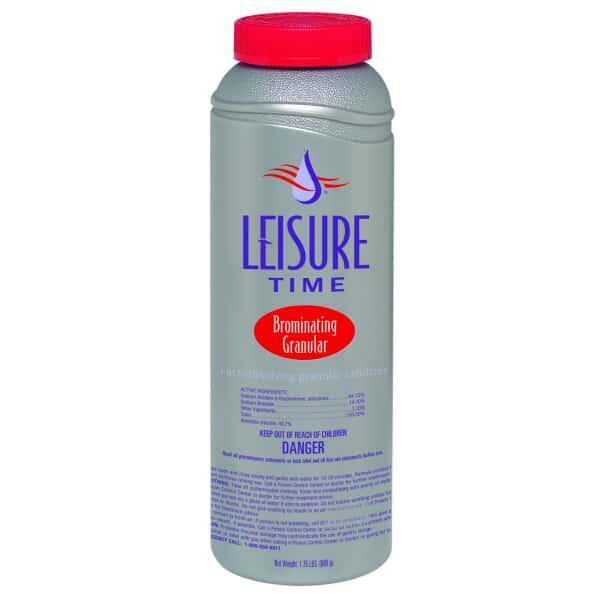 Leisure Time offers an entire line of spa chemicals that deliver cutting edge care to your hot water to keep your spa or hot tub running in mint condition, year round, for years to come. Brominating Granular is one of those maintenance chemicals that you should keep on hand, regardless of the time of year. Bromating Granular is a one step sanitizer and shock for hot water that runs in spas and hot tubs. Leisure Time’s Brominating Granular dissolves completely to deliver fast acting chemicals. It leaves neither residue nor clouds behind in the water. Enjoy a reduction of bacteria and a clearer, more sparkling pool of water. We offer free shipping on all orders over $40 in the contiguous United States. Orders under $40 will incur a flat $5.99 Shipping Fee. Spa chemicals and supplies ship via UPS / Fed Ex. Most delivery times within the Continental U.S range from 2-5 days depending on location.